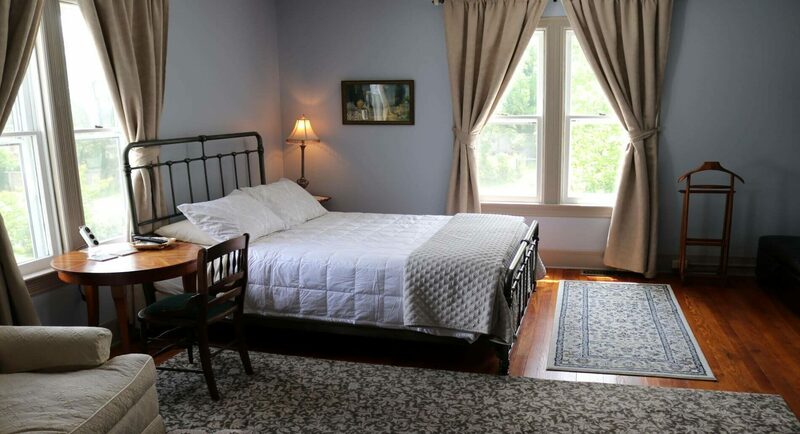 Offset from the main hallway by a vestibule, The Sycamore Room is the most secluded guest room at Laurel Manor House Bed and Breakfast. This spacious and sunny bedroom is the perfect place to spend a weekend getaway or week-long vacation near Washington, DC, and Baltimore, Maryland. With windows facing both south and east, this cheery accommodation is outfitted with a blend of both new and antique furnishings: a queen-sized bed, a comfortable reading chair, an heirloom armoire, and a lovely old dresser and mirror. 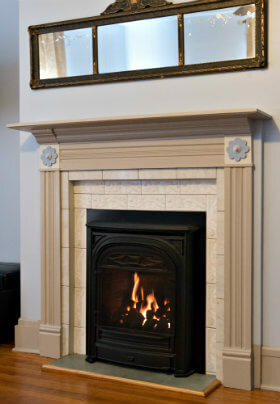 The Sycamore Room boasts a remote-controlled gas fireplace that is framed with new ceramic tile and a mantel that is original to the room. Other amenities include: a clock radio, a ceiling fan with remote control, a wall-mounted flat-screen television, and high-speed Wi-Fi (throughout the house). Additionally, The Sycamore Room has an optional fold-out twin bed with a memory-foam mattress. 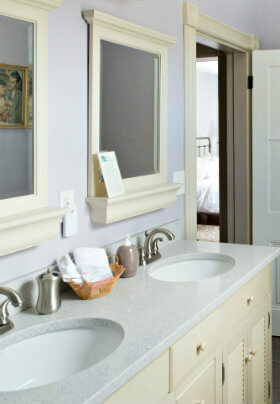 The private bathroom has a stunning ceramic-tiled shower with glass doors, two sinks, a lighted make-up mirror, a hair dryer, soap, and shampoo.